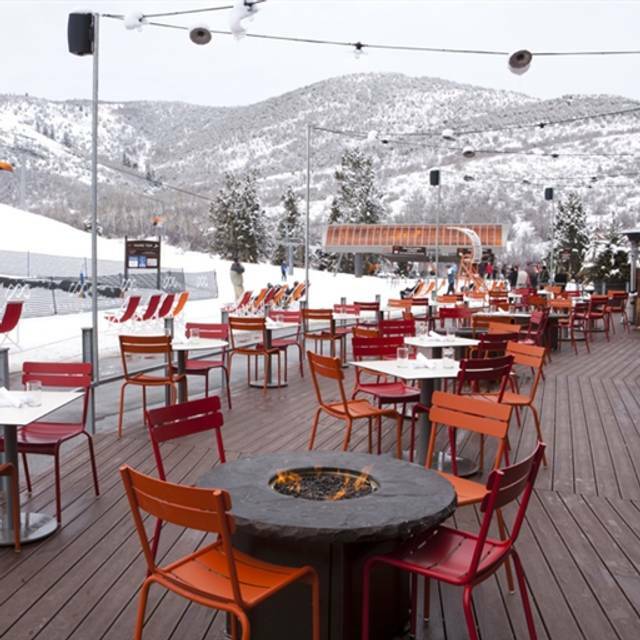 Red Tail Grill is located in the Grand Summit Hotel at Park City, Canyons Village Base, just steps from the Ski Beach and Orange Bubble Express. Red Tail brings a Western twist to the English gastro pub offering traditional tap house fare along with Western favorites. With its mountain views and wide selection of beers and hand crafted cocktails, it’s easy to see why the Red Tail Grill is a favorite gathering spot after a day on the mountain. Cup of soup & romaine salad with tomatoes, cucumbers, croutons & parmesan; choice of balsamic vinaigrette or ranch. We enjoyed a lovely Apres ski. We had a friendly waiter a delicious food. We enjoyed the hummus & nachos. Salads and salmon were fresh. Nice portions. Recommend for families- great kids menu. our waitress was a tall brunette young lady with her hair pulled back - I can't remember her name - she was amazing and friendly with all of us - I was very impressed by her. The atmosphere and views are amazing! My husband and I took our four teenage children and they had something delicious to satisfy everyone. We recommend the burgers, brisket nachos, ahi tuna and spinach artichoke dip to anyone who wants a good meal on the mountain. Party of 6, so gratuity was automatically added. That is the perfect excuse for service not to care. Ask the girl giving water how she is doing... “fine”. The guy who dropped off the appetizer did not literally say a word. Put the food on the table with a slight toss and walked away. Everyone having beer with dinner (530pm) except for me and I Had to ask for a soda refill after it was empty for a good 10 minutes? Come on..
My mother who used the restroom after dinner encountered no toilet paper in the stall. This was not after a long night/dinner rush. This was all before 630 when we left and there were multiple open tables. It was not slow by any means but the reason we made early reservations were to beat the crowds. Not get poor service. Excellent food and service. Brittany was amazing. Highly recommend. Food was good, but expensive for what we got. Nice place to eat and enjoy good food. Had the salmon, which was delicious. The food was ok but the service was slow. I’m sure it’s better during the day with the ski mountain crowd. Average hotel fare. The staff were great though. Better burger and brisket nachos were the best thing we ordered. The restaurant was full by the time we left. Great for families and kids though they did run out of French fries. The hostess and manager were so helpful trying to get my opentable reservation to work. The food took quite a while to be served, therefore; we must our gondola because it had closed. I can't believe Utah only pours 1 1/2 oz. alcohol pours. They should charge far less for that reason. Family of 6 adults and 6 kids ate here for our last dinner of our vacation week. It was a bit pricey ($516 including cocktails, desserts, and 20% gratuity). Service was very gracious if not efficient. Food quality was reasonable (grade B in my opinion). Nice view overlooking the mountain. We made a reservation and they had our table ready when we arrived. Would probably eat here again. Clearly there is a new Chef/Management at Redtail. Last year they had good food. We ate there many times. This year it’s glorified cafeteria food. Don’t waste your money. Service was mediocre at best. Took 10 minutes to get water and another 10 minutes to get our drink order in even though we were one of three tables in the entire restaurant. Should have known better when we realized it wasn't busy on a Friday night and a holiday (Easter) weekend. The beet salad had no taste and although I requested the BBQ sauce for the bison burger on the side, of course it was slopped on anyway. I got a "sorry" when I informed the server, not an offer to bring me another one or take it off of the bill. Knowing I was upset, the server brought me the bill and informed me that she had added a 20% gratuity because I was a party of 6 even though four of my party were kids that ordered from the kid's menu. Oh yeah, bartender was rude and acted as if she was doing me a favor by taking my drink order. Grand Summit Hotel and Red Tail Grill need an overdue facelift and new management. Good location if you are staying at the Grand Summit Resort. However , food is just ok and over priced. The kitchen closes at 10pm - way to early for being the only place to eat at the hotel. We were very upset about our experience at Redtail Grill. It took forever to order our dinners after our servers initial greeting. Since we had 5 kids with us when we finally got his attention we asked to order the kids meals right away. Despite this it took a half hour and hour to get one kid's meal....the best part was after they placed it in front of my son and he took a bite they realized it was for another table so they couldn't take it back. Mean while the rest of the four kids watched him eat and had to wait another 30 mins till the food came. Our server was MIA most of the time so we had no water and when we finally got all of our food couldn't find him to ask for ketchup. I was so upset about the kid food situation I went and spoke to the manager. His response " oh sorry we are down a server and one oven isn't working".....so they brought us some more water (as we had none) and then we waited some more for the adult food. No attempt to comp the kid's meals or give us a free kid's dessert...nothing but a blow off apology. Would not recommend this place-clearly gets people because of location only and does not care about customer service. And food was mediocre at best and expensive! We had a large group which can be tough to handle, especially with 14 kids among six families. Our server did a great job keeping up with our drink orders and making sure everyone had what they needed. We all would definitely go back. Best margaritas ever. Wonderful breakfast menu. Fabulous southwestern lunch menu. Friendly and helpful waiters, plus Chris the best busser, and joe, the involved manager. Also a great hearty dinner menu. So much better than the old docs. Although the service was slow, the food was delicious. I highly recommend the short ribs nachos... they were excellent!